We are pleased to announce $4,219.32 was raised by the ACDA and an additional £1,026 was raised by our sister UK registered charity, The David Ashwell Foundation, for a grand total of $5,631 in connection with Rare Disease Day on February 28, 2018!! Our sincerest thanks to the families, friends, colleagues and classmates of the ACDA and The David Ashwell Foundation for raising such an incredible amount for ACD research! In the U.S., we would like to give our very special thanks to Lee County Bank (Fort Madison, IA), Family Design Resources (Harrisburg, PA), Discover Little Miracles (St. Michael, MN), East Quogue Teachers Association (East Quogue, NY), East Quogue Elementary School, (East Quogue, NY), The Suffolk County District Attorney, Economic Crime & Cyber Crimes Bureau (Hauppauge, NY), Suffolk County Department of Law & Suffolk County Office of Risk Management (Hauppauge, NY), Suffolk County Office for the Aging (Hauppauge, NY), Suffolk County Budget Office & Suffolk County Federal & State Aid Unit (Hauppauge, NY) and Suffolk County Department of Audit & Control & Suffolk County Office of Administration (Hauppauge, NY). In the UK, we would like to give our very special thanks to Teesside University, Human Nutrition Research Centre, Newcastle University, Appleton Wiske School, Kirby Great Broughton school, Lewes priory school, Moulscoomb primary school and Hertford infants school. We would like to thank all of our individual donors and everyone who wore #JeansForGenes or sent pictures wearing the ACDA logo! Thank you for your outstanding support of our ACDA families. Please see below for ways that our ACDA families and friends supported Rare Disease Day in 2018! Update (February 28, 2018, 11:59 p.m. EST): As #RareDiseaseDay 2018 draws to a close, we would like to give our sincere thanks to our ACDA community, including generous donations made this evening in honor of Hannah, Amelia Lee, Dawson and Chelsea. It has truly been a fantastic day of awareness and giving. Update (February 28, 2018, 7:00 p.m. EST): Thank you for the additional generous donations in honor of Dean, Joseph, Myla, David, Phoebe, Ronan, Imogen, Avery and Fraser! The donations are flowing in and the day is not over yet if you would like to make a donation to find the cause of and cure for ACD in honor of a loved one. Look for another follow-up post recognizing tribute donations received this evening! Thank you for your continued support on #RareDiseaseDay 2018! Update (February 28, 2018, 2:00 p.m. EST): Thank you for the generous donations so far today in honor of Callie, Valerie, Fallon, Annabelle, Sadie and Johnny! #RareDiseaseDay is our final push towards funding a 2018 grant for ACD research, to be awarded and announced later this year. Please help us cross the finish line! Look for additional follow-up posts recognizing tribute donations made throughout the day. As always, thank you for your support! Update (February 28, 2018, 12:01 a.m. EST): It’s here! Today, February 28, is Rare Disease Day! In addition to spreading awareness about ACD, today also marks one of the ACDA’s biggest fundraising days of the year and your support matters. We will be showcasing donations made today in tribute of a loved one with a special “Rare Disease Day” recognition image featuring the child’s name. The ACDA will also send a card to the honoree’s family acknowledging your gift. When you give in honor or in memory of someone special, you also support our mission of finding the cause of and cure for ACD. Numerous organizations and schools around the world are participating in our #JeansForGenes campaign to wear jeans to work or school with a donation. Other ways to participate include visiting our ACDA store linked below or simply inviting your friends and family to “Like” our Facebook page. Update (February 21, 2018): Only one week until Rare Disease Day! Please visit our website to learn about different ways you can participate in Rare Disease Day for the ACDA, including flyers to print for our $5 “Wear Jeans to Work” day on February 28 and links to #ShowYourRare profile frames! 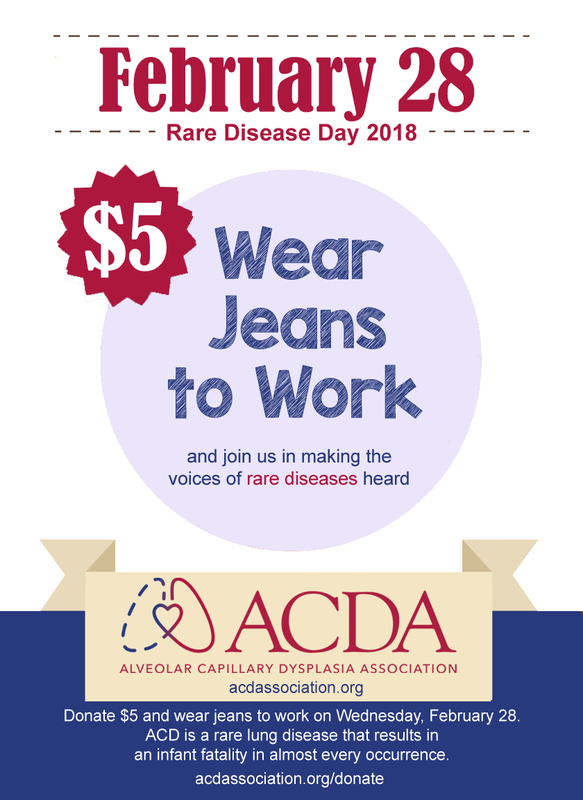 It’s not too late for the ACDA to create a special “Wear Jeans to Work” day flyer personalized with your child’s name if you would like to organize the event at your workplace. Please send us a message, leave a comment or email (president@acdassociation.org) if you would like to request a customized flyer for distribution. Rare Disease Day is one of the ACDA’s biggest fundraisers during the year and we need your help to continue funding annual ACD research grants! THANK YOU! Rare Disease Day is an international advocacy day to bring widespread recognition of rare diseases as a global health challenge. The day is celebrated on the last day of February every year – February 28 in 2018. The ACDA has signed on once again to partner with NORD to support this awareness campaign and we encourage everyone to participate in some way. Click to see how the ACDA supported Rare Disease Day in 2017 and 2016! Click HERE for ways to participate in the U.S. in 2018 and click HERE to visit the EURORDIS website for Rare Disease Day 2018 in Europe.